Our reliance on highways for commerce, to commute to work, shop, vacation, and other activities, is creating significant demand on the system. Performance, reliability, safety, and asset preservation are key concerns for transportation agencies. 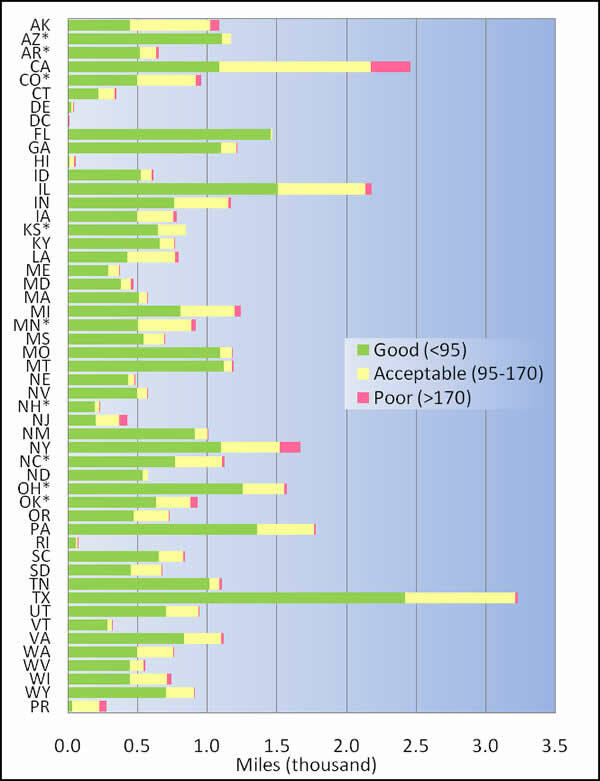 Operating speeds, congestion, and pavement and bridge condition are some of the ways to measure the performance, condition, and safety of the nation's highways. The International Roughness Index (IRI) is one of the most widely used measures of pavement smoothness or ride quality. Pavements with an IRI rating of less than 170 are considered to have an acceptable ride quality, while those with an IRI of less than 95 can be considered to have a good or very good ride quality. The National Bridge Inventory documents the conditions of bridges on all public roads. Bridges are rated as "not deficient," "functionally obsolete," or "structurally deficient." A bridge rated "functionally obsolete" or "structurally deficient" is not necessarily unsafe. Rather, it typically has an older design that lacks modern safety features such as adequate shoulder space, an appropriate railing system, or other features. 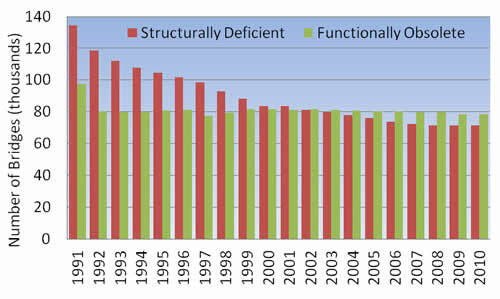 The number of structurally deficient bridges has declined since 1991. The number of functionally obsolete bridges has stayed relatively constant since 1991. Of 604,460 bridges in 2010, 71,177 (12 percent) are rated structurally deficient and 78,477 (13 percent) are rated functionally obsolete. 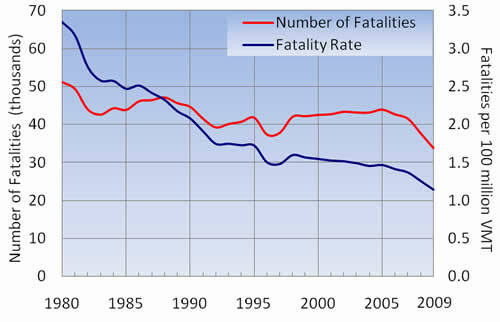 The fatality rate (fatalities per 100 million vehicle miles of travel) on the nation's highways continues to decline. In 2009, the fatality rate reached an historical low of 1.15, a total of 33,808 fatalities. The highway and transit authorization bill from 2005 to 2009, SAFETEA-LU (Safe, Accountable, Flexible, Efficient Transportation Equity Act: A Legacy for Users), authorized a core safety program known as the Highway Safety Improvement Program. FHWA works with other federal, state, and local authorities and private organizations to develop new strategies and approaches to improve highway travel safety.